Bengaluru: A Flipkart IPO is unlikely to happen for many years to come, as Walmart Inc. will have to invest heavily to make its $16-billion acquisition work. Last week, Walmart agreed to buy a 77% stake in Flipkart for $16 billion with the rest being held by minority investors, chiefly Tiger Global Management, Tencent Holdings, Microsoft and co-founder Binny Bansal. It also said it supported Flipkart’s ambition to go public. Walmart has told Flipkart’s leadership team to not worry about an IPO anytime soon, according to two people familiar with the matter. Walmart is viewing Flipkart as a long-term bet that may take years, or even decades, to yield excellent financial returns, these people said. Both of them requested anonymity. “They have said they are taking a 20-year view on Flipkart. An IPO is not going to happen any time soon," one of the people cited above said. On Friday, Walmart had said in a regulatory filing in the US that Flipkart’s board or its minority shareholders could force the company to go for an initial share sale four years after the deal closes. However, there is an important clause that can prevent minority shareholders from forcing an IPO—if after four years, Walmart owns over 85% of Flipkart, minority shareholders of the latter will lose their veto rights on business decisions and transactions at Flipkart. Walmart has already indicated that it may end up investing an additional $3 billion in the Indian e-commerce company within the first year of the deal closing. According to the filing, Walmart has the right to appoint five directors to Flipkart’s board, which will have three other members—Binny Bansal and nominees from Tiger Global and Tencent. Walmart may increase the board size to nine members later. For Walmart, a lot is riding on Flipkart, its biggest acquisition yet. But the hammering that its stock received on Wednesday after the buyout was announced may just be the beginning of the challenges that the retailer faces in making its Indian acquisition work. 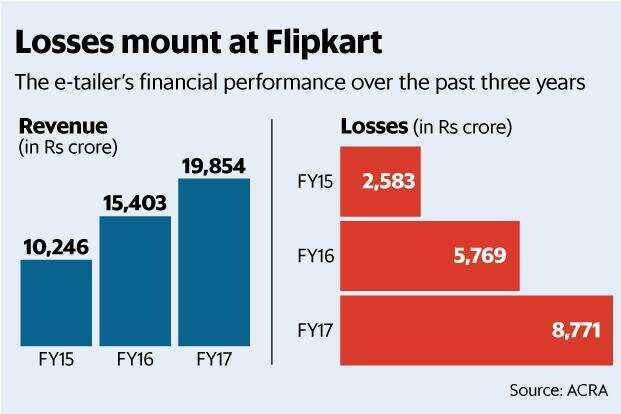 Cutting Flipkart’s massive losses while keeping Amazon India at bay, building up the company’s depleted senior leadership team, retaining key middle managers and making the combination of Binny Bansal and CEO Kalyan Krishnamurthy work are some of the immediate challenges that Walmart faces. In any case, it’s evident that the looming battle with Amazon, which was in the race to buy Flipkart, in the $18 billion e-commerce market will require billions of dollars in fresh investments. But Walmart’s investors will not be that forgiving. During a conference call with investors after the Flipkart-Walmart deal, the US firm’s top management team was grilled by analysts and investors on whether it would cut the e-commerce company’s massive losses anytime soon, with some of them even wondering whether Flipkart would ever turn profitable. The US-based retail giant’s top management put up a brave face and defended the acquisition, saying that it was a long-term bet in a market that was too large to ignore.